I used a little science to get around the rumble issue with these vertical cut Edison Diamond Disc records. I use a very special vintage tonearm made by Pickering - the 190D. The arm has no vertical travel aside from a very light assembly holding the cartridge. Because of enertia, when the record is played at a low speed, the small assembly can move up and down with the irregularities, reducing the rumble. However, the bass frequencies were reduced due to the extremely low mass of the cartridge assembly. The solution was adding some mass to the assembly, which, because of enertia, the added mass serves to stabilize the cartridge, and extract the lower frequencies. I started this project about 30 years ago, and had recorded about 20 of my Edison Doamond Disc records and passed them on to other collectors, so for those I had to rely on my original transfers. The rest are fresh transfers from records still in my collection. The resulting warmth and depth of sound is really amazing. I only wish I'd kept the records for my original selection to do the fresh transfers for them too. They still sound pretty good regardless. 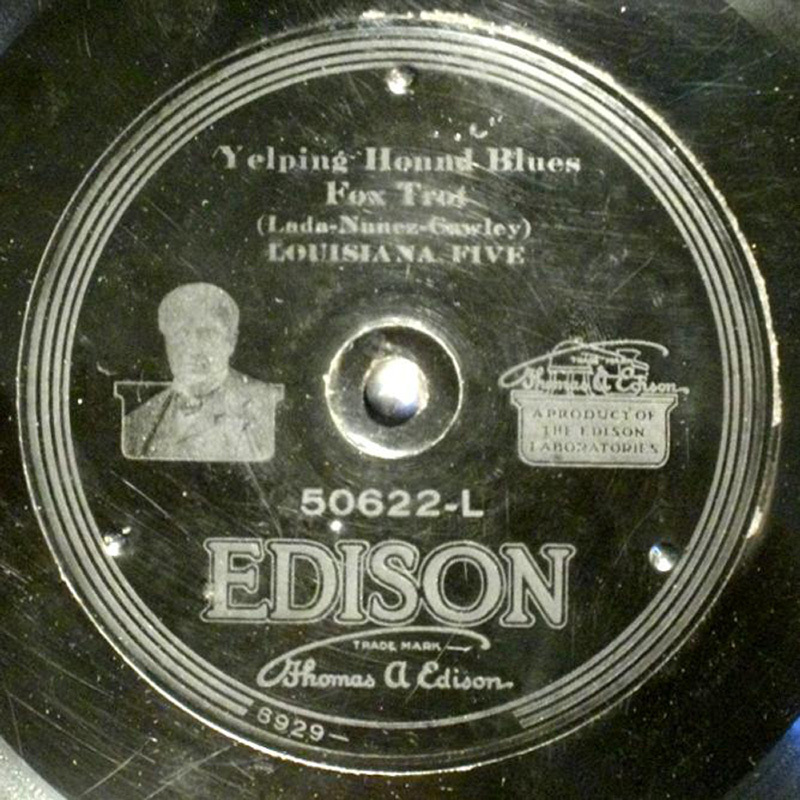 The Louisiana Five first recorded Yelping Hound Blues as a 12"Emerson. This Edison was recorded soon after, and because of the longer playing time, it fit on a 10" record. Clarinetist Alcide Nunez was born in 1884, playing first the guitar, then switching to clarinet by 1902. Pee Wee Russell claimed that Nunez was the best jazz clarinetist in the world. By 1905, he was playing with Papa Jack Laine's band but in 1916 left for Chicago with Stein's Dixie Jass Band, later to be renamed the Original Dixieland Jazz Band. Before their first recording, he left to join Tom Brown's band until he, with drummer Anton Lada left to form the Louisiana Five. Trombonist Harry Raderman, born in 1883 was a prolific recording artist but very little is known about the musicians in his band. Pianist Vincent Lopez's first band was formed with clarinetist Billy Hamilton. Tommy Gott-t/ Harold Geiser-tb/ Tony White-d was the rest of the ensemble. I have included two titles listed in Rust's Jazz Records - Patches and Bo-La-Bo. Born in 1878, Julius Lenzberg was musical director at B.F.Keith's Riverside Theatre by 1918 and was the pit orchestra for the Broadway musical Nikki in 1931. Saxophonist Rudy Wiedoeft performs the challenging "Saxema". He later recorded this at a slower tempo for Victor I imagine to enable musicians to learn the piece. The Tuxedo Dance Orchestra's first recording was Mary -included in volume one of this set. It seems that the Dorsey Brothers recorded much later with this band but little else is known, but Harry Reser directed some sides around 1924.Recoerded in 1920 The Three Vagrants was one of the earliest ensembles to feature the guitar. Nicolas Orlando recorded a number of sides from 1919 - 1927 but little is known about his band.